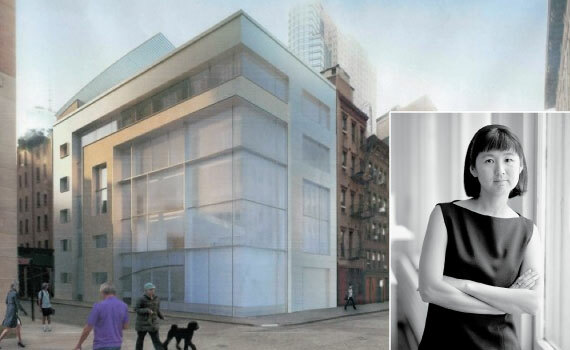 It’s been ridiculed for looking like a piece of Swiss cheese, but Maya Lin’s new Tribeca building is now set to hit the market as the largest mansion in the city. Last year, plans for the new single-family mansion at 11 Hubert Street were given the green light by the Landmarks Preservation Commission. And now, the 20,000-square-foot building will list with Andrew Azoulay of Douglas Elliman for $35 million, according to the New York Post. Plans call for the existing three-story building at 11 Hubert to be gut renovated and two more stories to be added. That means that, beyond the $35 million purchase price, the new owners will need to spend an additional $15 million to develop the project. Hedge funder Adam Zoia is the current owner. Designed by Maya Lin — the woman behind the Vietnam Veterans Memorial — the mansion will be 70 feet tall and 50 feet wide. It will also include a four-car garage, 82-foot-long swimming pool, high-speed commercial elevator, interior courtyard, basketball/squash court, three kitchens and a roof-top terrace.